Stunning footage of hikers walking on beautiful clear ice on a lake in Slovakia’s Tatra Mountains went viral, gathering more than two million views in just a few days. Slovakian hiker Tomas Nunuk posted a video of he and his friends walking on a crystal clear frozen lake in the High Tatras mountain range on Monday. 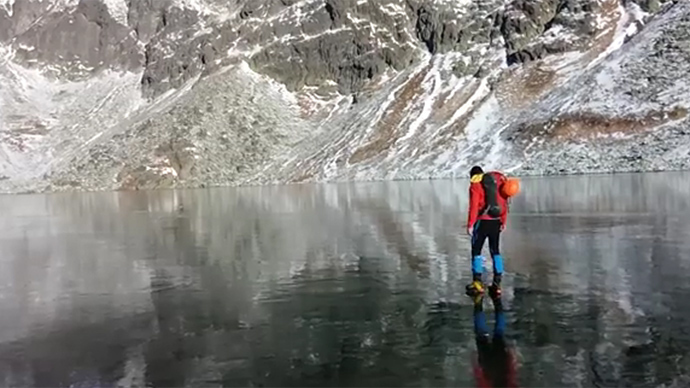 The 38-second recording shows water so clear that each stone on the bottom of the lake can be seen as the operator walks on the ice and films from his perspective. “It’s almost like floating!” wrote Youtube user Paul Hatfield, commenting on the video. “This is incredibly dangerous as that ice appears very thin. If you pay attention at :22, you'll hear the squeak of the ice cracking and actually see a crack appear under his left foot,” wrote user DrTenochtitlan in another comment. The Tatra Mountains are located on the border of Slovakia and Poland. It is the highest mountain range in the Carpathian Mountains and houses many lakes. Ice walking can be very dangerous, but many people attempt it for the adrenaline rush and beautiful views. Russia’s Lake Baikal – the world’s oldest and deepest body of freshwater – is a popular destination for such daredevils.